Raven McAllan is a new to me author, and I found the writing style enjoyable and easy to read. Theresa Kyle is an ex-courtesan, who is being 'stalked' by a past client. Jamie, the Earl of Weston, is being stalked like a wounded animal by lionesses – his mother and her friend are trying to force their children into a marriage. (I've never understood this premise – why would mothers want their children utterly miserable together? It wasn't for money, or status – just that a pair of best friends wanted their children to marry, and be unhappy forever. I've never understood this premise in his-ro.) A seamstress, the mutual friend of both the hero and heroine, offers to help both parties out by introducing them. This is a relationship of convenience storyline. Theresa and Jamie need one another, need the scandal of their relationship, to remove the issues plaguing them, and this draws them into each other's orbit to fulfill the romance. Banter. Heat. Theresa and Jamie are good with one another. Jamie was loyal, protective, and witty, whereas Theresa was strong-willed and teasing, yet completely lacking self-preservation. Their interplay was light and lusty. But, there was a ton of repetition in the dialogue, having the same conversations over and over again. Where a lot happened off-scene, so it made it feel as if no one was doing anything about the situation other than talking about the situation. While I enjoyed the story, I did have a few issues with it. Theresa is an independent woman, one who refused to bend to the rules of polite society and be beholden to a man. A spitfire. Yet, this intelligent woman, out of stubbornness, turned particularly idiotic when it came to her personal safety and that of her household staff. The 'tantrum' the author wrote Theresa to have felt out of character, out of nowhere, and didn't fit into its location in the story itself. It turned me off from Theresa – childish, when Theresa was written to never being childlike, let alone getting to act as one when she was one. With no buildup, one scene ended, and then Theresa was throwing things and breaking them, yelling at Jamie – it was so jarring, when on the page before, she was meeting with the Earl's brother – the Duke – and had just had a kidnapping attempt. What happened and her interaction with the brother were finally brought up several pages later, after her fit for Jamie having to try to protect her, since she refused to protect herself. If anything, a "thank you" and "why is your protection so inept?" would have been in order, not breaking belongings like a two-year-old who doesn't understand consequences, and how once broken, it's useless, or the fact that she could have hit Jamie with the projectiles and killed him. These outbursts of 'independence' were tucked in, out of place of the overall happenings on the pages. Not independent and unconventional for the times, it made Theresa look unintelligent and unhinged in my opinion. My biggest issue ties into with what I wrote above. With being assaulting, attempted kidnappings, windows breaking, and extortion, Jamie and Theresa's staff tried to protect her, yet she just tossed it off, or was offended. "How dare they try to protect me, when several men just tried to kidnap me off the street in front of my house! How dare they! I'm an independent woman!" That made me not like the character, and found everyone inept, when the villain of the story was written as a bumbling, desperate idiot. So my questions was, why was everyone else so... inept? It was like 10/1 protectors vs enemies, and they always slipped away, no one asking, "Who sent you?" In fact, they knew who sent them, and just... ignored it, in order to allow more pages before the conclusion. So while I enjoyed the overall premise, the characters (when they were acting 'in' character), and the side characters, the villain/reasons/conflict weren't strong enough to support the page amount, even with so few pages. I do recommend the book, and I do look forward to more by this author and in this series. If I'd read it in a reading frenzy, while suspending belief, none of the cons would have frustrated me. 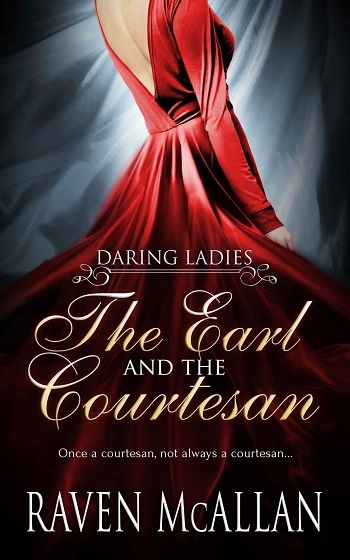 Reviewers on the Wicked Reads Review Team were provided a free copy of The Earl and the Courtesan (Daring Ladies #1) by Raven McAllan to read and review.